Palm Point of Sale – Designed specifically for the petroleum convenience store market, Pinnacle’s POS is flexible, reliable, and secure. 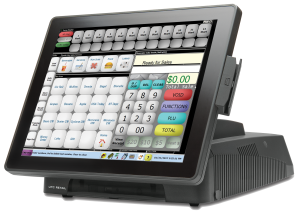 Pinnacle’s POS is the fastest point of sale on the market, the easiest to configure and use by your store personnel, and has more interface and device integration options than any other. Payment Networks– Pinnacle’s POS separates the payments logic from the core point of sale, enabling a secure payment gateway that can support processing to multiple payment hosts from a single POS. This ability to split route (“split dial”) offers you the ultimate flexibility to offer the payment options that are right for your business and your customers. Integrated support is available for most major oil brands and generic payment processors, proprietary cards, fleet, local accounts, ACH, EBT, 3rd party coalition loyalty and rollback hosts, check conversion, private branded cards, and pre-paid card networks. Peripherals Support– Don’t let your point of sale supplier dictate which peripherals you can use; Pinnacle’s POS supports more peripheral devices than any other in the market. Printers, dispensers, scanners, PEDs (Pin Entry Devices), signature capture terminals, contactless payments, coin changers, electronic safes, kitchen video, integrated scratch lottery, DVR, price signs, car wash controllers, tank monitors, money order machines, and more; we have interfaces to support nearly any type of device your business demands. Remote POS Management– Remotely configure and update your POS from a single home office system, accessible from any web browser. Remote POS manage­ment allows you to configure the point of sale with an intuitive interface that allows you to preview exactly what the store personnel will see; no more complex configuration files and guessing what it will look like after changes are implemented. Update PLU boards and configurations on the fly for one store, a group of stores, or all stores, and schedule future updates in advance. Falling behind on EMV Compliance? Contact us for a no-obligation consultation to learn your upgrade options today! If you would like more information about The Pinnacle Corporation and our products, please fill out the form below and submit. Tell us how we can help you further.